The Hummel Resource Guide is an information packed guide to help you authenticate, date, care for and value your Hummel figurine(s). The information in this guide is for anyone looking for information on their Hummel figurine. This guide provides knowledge and helpful tips for all levels of collecting. Using this guide can save you both time and money. Preserving your Hummel is a key to maintaining its value. Age and condition are two of the key factors when it comes to determining the value of a Hummel. 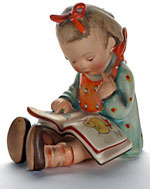 This Humvmel resource guide has easy to use instructions on how to care for, clean, display and store your Hummel figurines. In addition I have included information on the history of Hummel, frequently used term guide, and a detailed date guide. Does your Hummel have a silvery sheen? What if this has already occurred? Payments are securely processed by PayPal. An email with a download link for this product will be sent to you after you make the payment.